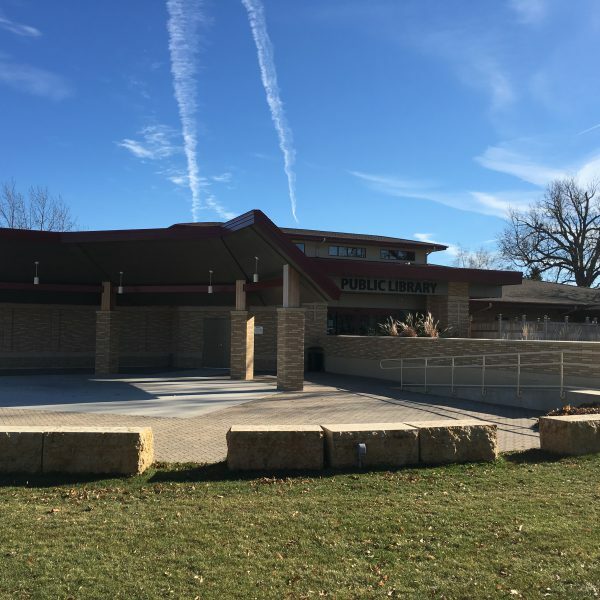 It’s easy to see why Schreiner Memorial Library was awarded Library of the Year from the Wisconsin Library Association in 2016. 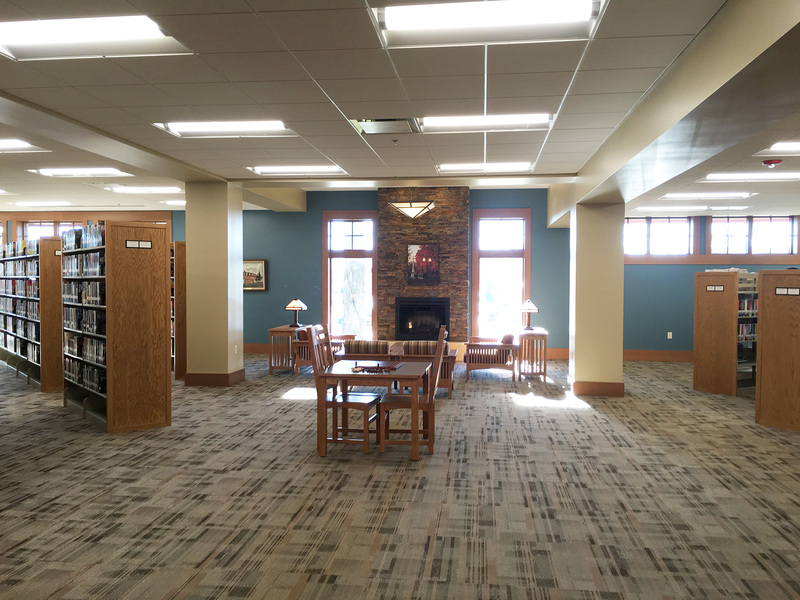 Renovated and expanded in 2015, the library was skillfully designed to serve the current and future needs of the residents of Lancaster, Wisconsin, and the surrounding communities. 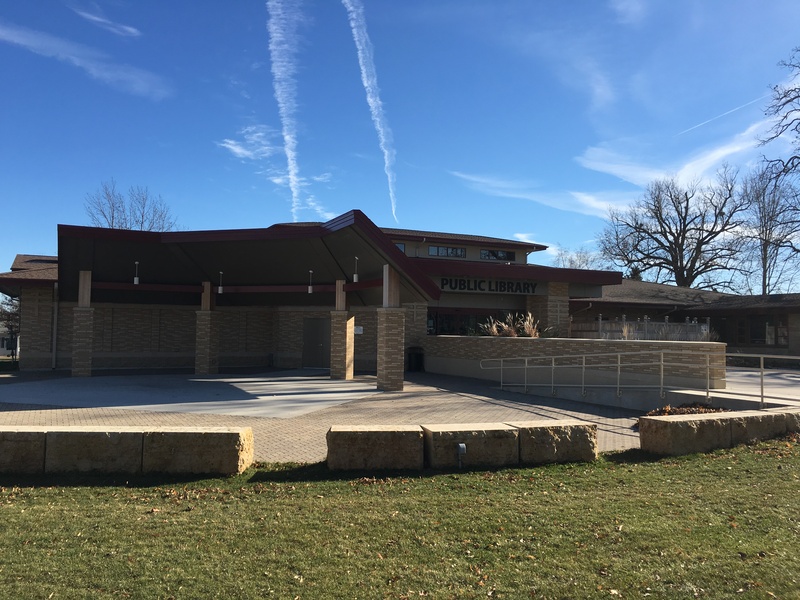 Situated upon a city block, the library features an outdoor performance plaza and open green space for outdoor programming. Just outside the main doors, a unique bike rack serves 2-wheeled commuters, and inside visitors are greeted by an open, airy and light-filled welcome area that allows after-hours access to a large programming room. 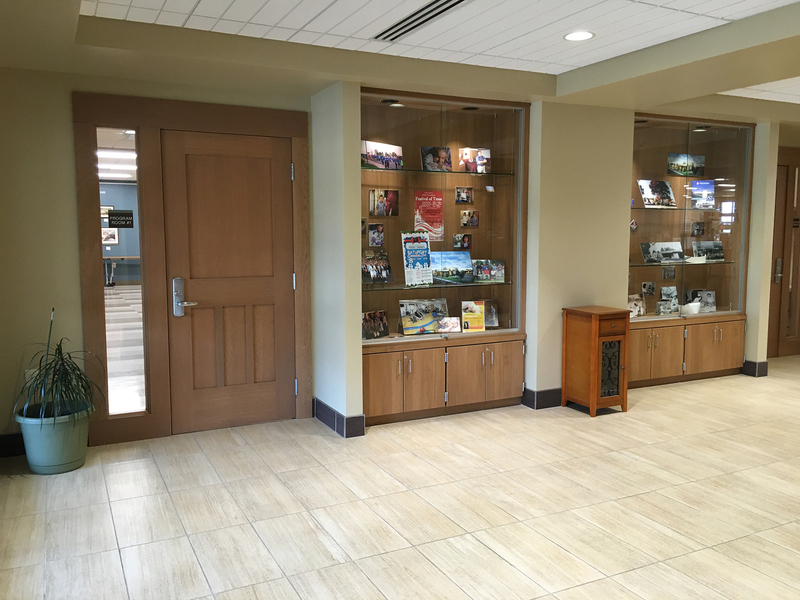 As they enter the main area of the library, visitors can browse displays created by local groups. 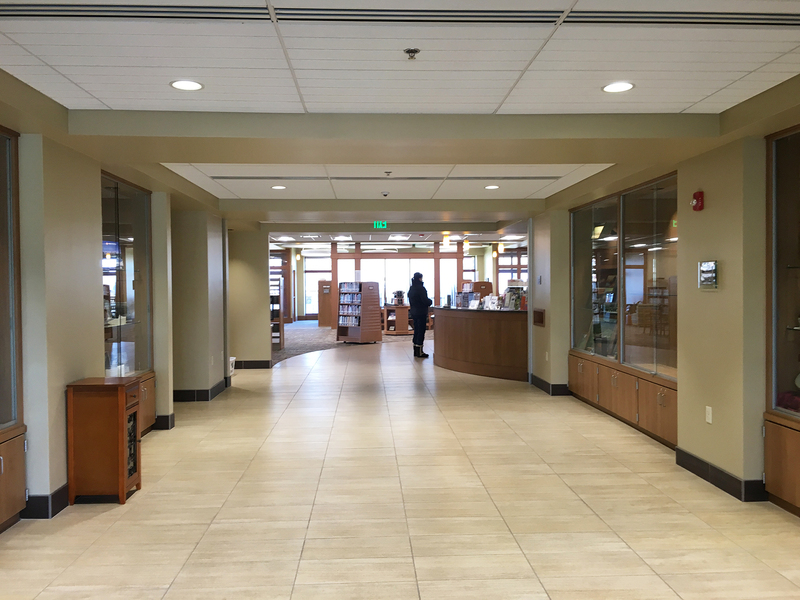 My colleague and I visited with Library Director Jennifer Bernetzke and Library Assistant Kristin Holman on a bright, sunny day, and upon entering the main library, I was struck by how the sunlight filled the space. 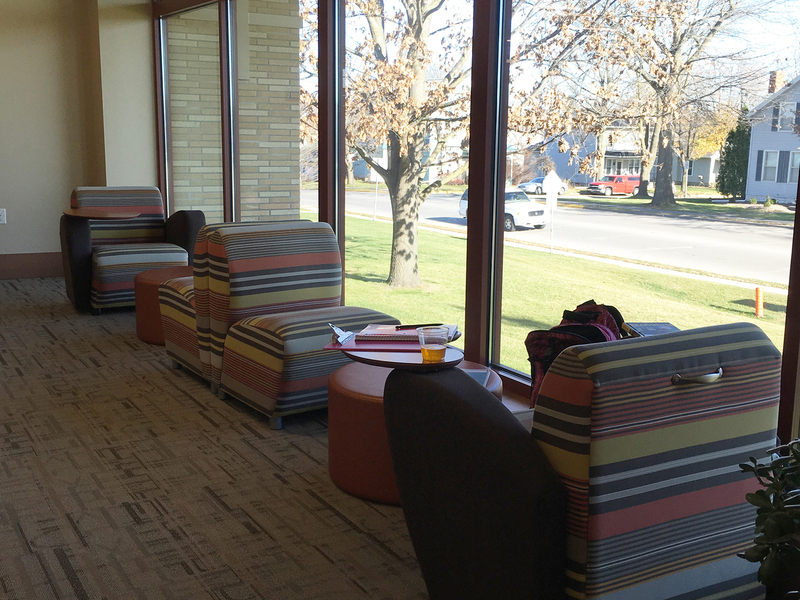 A variety of casual seating areas and work spaces, along with four small meeting rooms, were situated to take advantage of the natural light. 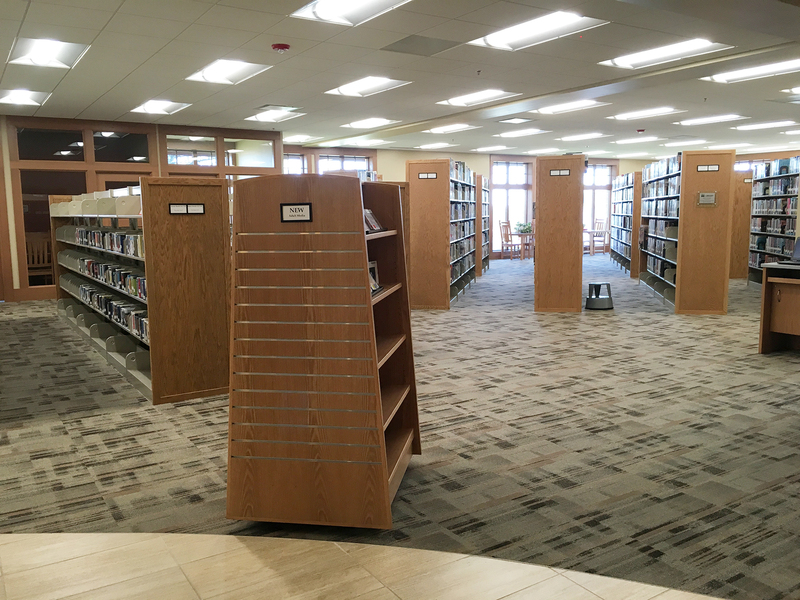 Shelves were positioned to create clear sight lines from the main service desk to most of the library, as well as the windows. 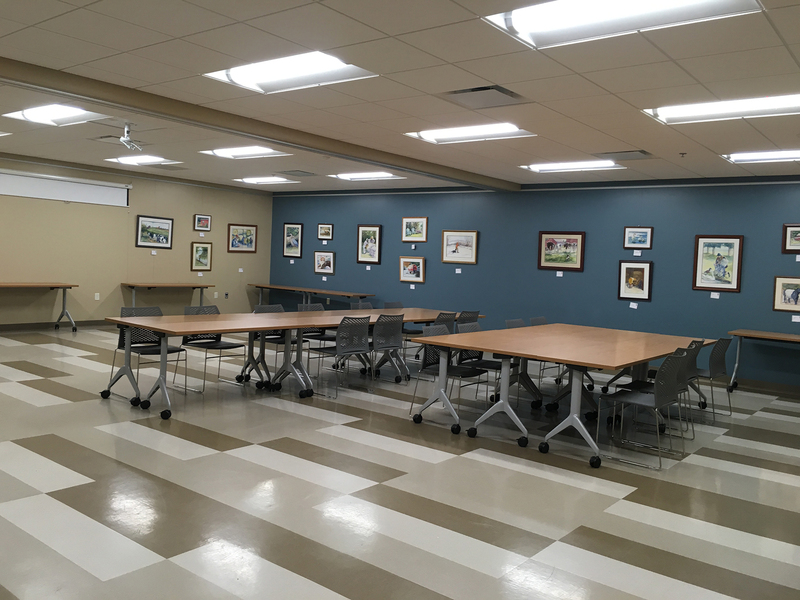 The library designers had seamlessly executed library design best practices, and I could have happily “officed” at this library! In addition to a well-planned physical space, there were other special touches that bring home the importance of serving community. 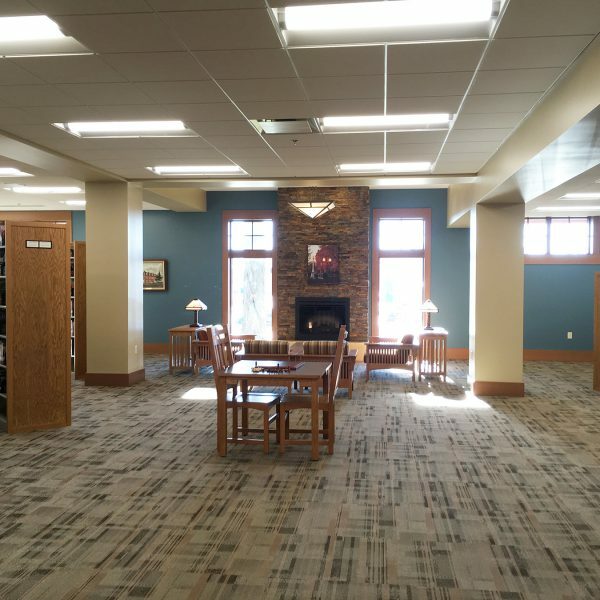 In Wisconsin, winters can be brutal, and the library featured a fireplace with comfy seating to take the chill out of the air and a small tea bar to offer warmth and hospitality. 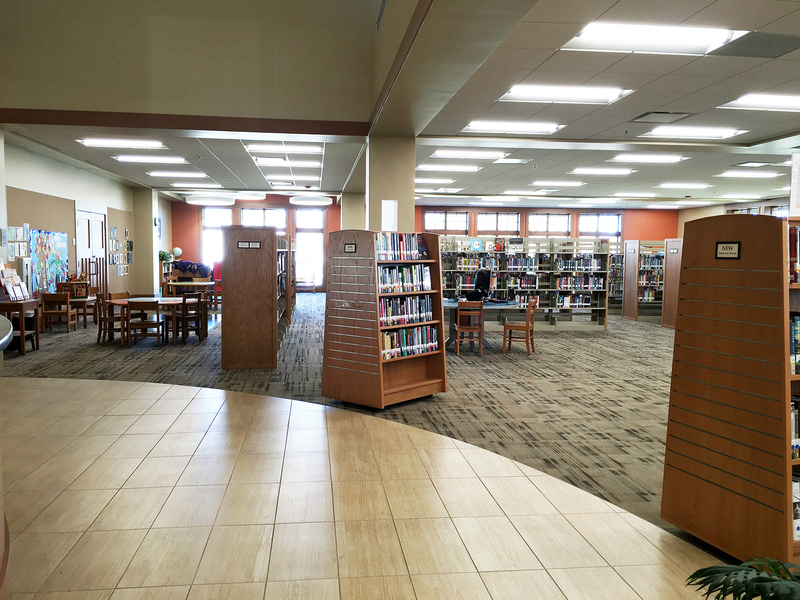 The community is a significant part of the library’s story. 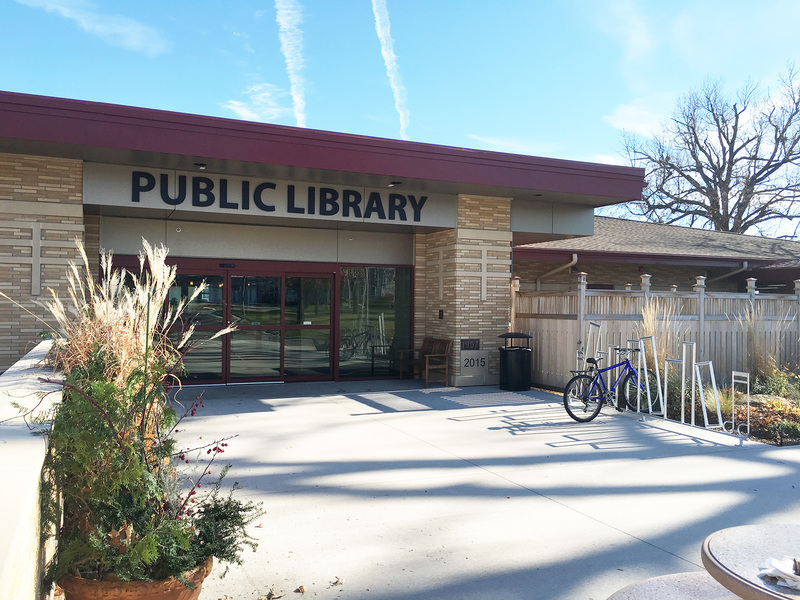 The city pledged $1 million for the new library, with the Library Foundation raising another $2.2 million from private funding partners in the community and surrounding service area of 10,000 people. One of the most impressive statistics is the usage of the programming room. By mid-November 2016 there had already been 300+ room reservations, including scout troops, after-school programming, movies on early release school days, 4-H robotics club, baby showers, WIC meetings and a host of other programs. “New people come in for a program and discover the library. In August, door traffic was up 113%, surpassing 2013, which had been our best traffic year in history, and circulation is up 40%. We are seeing lots of new faces, and testing new programs and services to support the needs of our community,” said Bernetzke. Staffing is an important consideration in their program planning. Bernetzke and the staff of 4.5 FTE’s (plus 1.5 additional FTE’s at a small, 770-square-foot branch in Potosi, 12.5 miles from Lancaster) are focused on meeting community needs. Their mantra is “don’t duplicate services.” Instead the staff work to partner with other organizations and groups to offer complementary programs and services. 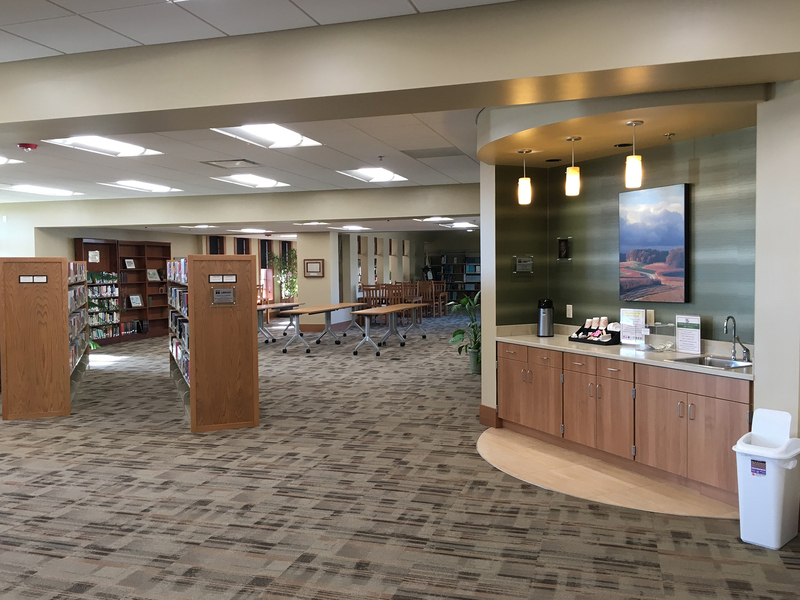 Two examples of these types of relationships include partnering with the Aging and Disability Resource Center (ADRC) to offer tablet training for older adults and participating in the rotation of the Southwest Wisconsin Library System’s themed makerspace kits. The staff at Schreiner is also making user-focused changes, starting with reorganizing their picture books by subject rather than author, as kids first get hooked on subjects (e.g., trucks, dogs, dinosaurs or princesses). They’ll also include a popular author category, featuring well-knowns such as Mo Willems and Dr. Seuss™, among others. 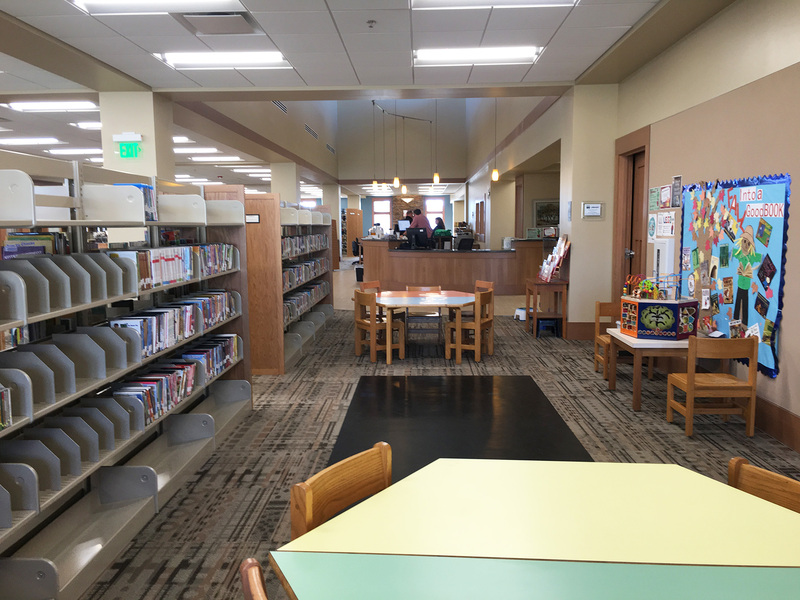 For their Easy Reading section, they are partnering with teachers to align with how the local elementary school collection is organized, keeping things familiar for the students to make it easy for them to find specific books or authors. At Schreiner, developing relationships with community members starts early, with the library giving every newborn a book while they are still at the hospital. Their weekly Toddler Tales programming includes a variety of sensory, STEM and building programs and activities, helping build a making mindset and preparing kids for school. Designers planned ahead for this type of programming by including a floor covering in the toddler area to make clean-up easy. For older kids, activities include a weekly LEGO® Club, after-school programming and movies on early release days. During finals week, the National Honor Society helps fund additional staffing, ensuring that the kids have the resources and space needed to help them prep in what can be a stressful time. In addition, the library is routinely used by home-school students and the online resource Mango Languages is popular for foreign language study. “The vast outdoor vast green space of the Performance Plaza brings another element of value to our community. We can host community bands, show movies outdoors, host music festivals and countless other things. We have hosted visitors from across Wisconsin and even from out of state to see our city and library. 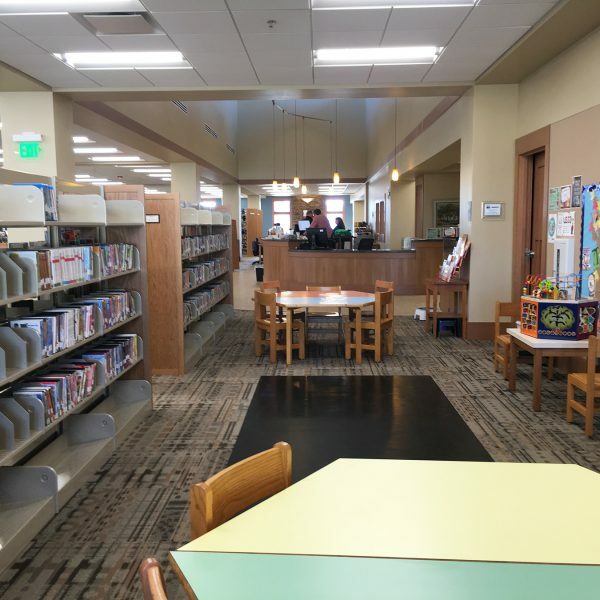 The library is an important asset to our community, which is also home to several other county services, including the courthouse, health center and the Herald Independent, among a host of other health, banking and agricultural-related businesses,” shared Bernetzke. Looking ahead, Bernetzke said, “We’re excited to continue to find new ways to engage with the community. Our service area ranges far beyond the 3,868 residents of Lancaster, for a total service population of 10,000. 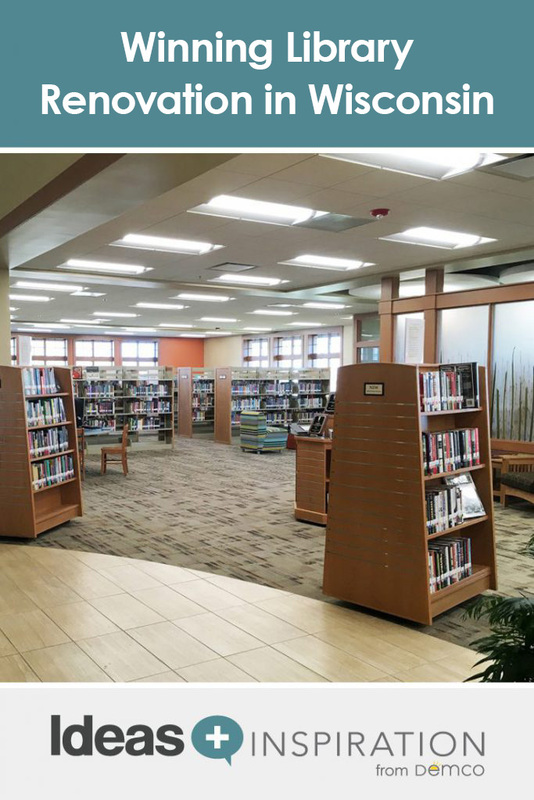 What kinds of things are your libraries doing to promote community engagement? 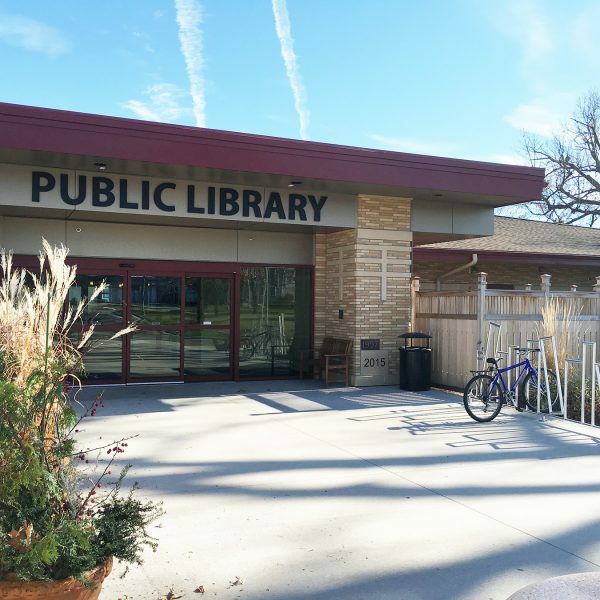 Share ideas you have had success with in the comments section below, and feel free to ask questions about Schreiner Memorial Library’s renovation project.